Upgrading is performed by using fedup. No errors/issues were observed during the upgrade. After upgrade F22 cannot establish connection. I would like to debug the problem, but I do not know where to look. Can someone guide me, please? Nov 23 10:31:43 E7440-DELL NetworkManager: <info>  (wlp2s0): Activation: (wifi) access point 'WLAN-XYZ' has security, but secrets are required. Nov 23 10:31:43 E7440-DELL NetworkManager: <warn>  Failed to GDBus.Error:fi.w1.wpa_supplicant1.NotConnected: This interface is not connected: disconnect. Nov 23 10:31:43 E7440-DELL NetworkManager: <info>  (wlp2s0): Activation: (wifi) connection 'WLAN-XYZ' has security, and secrets exist. No new secrets needed. Nov 23 10:31:52 E7440-DELL systemd: Started Hostname Service. Nov 23 10:32:09 E7440-DELL gnome-session: Gjs-Message: JS LOG: An active wireless connection, in infrastructure mode, involves no access point? Nov 23 10:32:09 E7440-DELL NetworkManager: <warn>  Failed to GDBus.Error:fi.w1.wpa_supplicant1.NotConnected: This interface is not connected: disconnect. It does not mean anything to me, so I shall Google to learn more. Last edited by blnl; 11-23-2015 at 10:28 AM. It looks like some sort of authentication problem. Are you sure your password is correct? 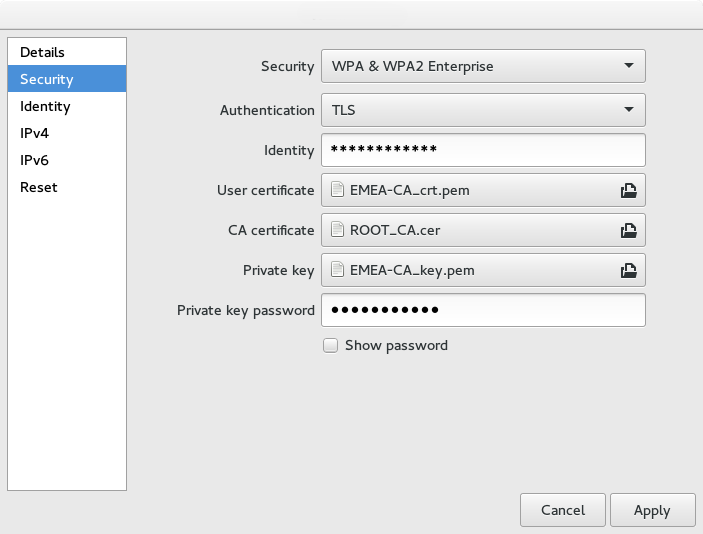 Maybe you also wanna check your wifi security mode (WPA Personal? WPA Enterprise?). Sep 04 09:43:41 E7440-DELL NetworkManager: <info>  Auto-activating connection 'WLAN-XYZ'. Sep 04 09:43:41 E7440-DELL NetworkManager: <info>  Activation (wlp2s0) Stage 1 of 5 (Device Prepare) complete. Sep 04 09:43:41 E7440-DELL NetworkManager: <info>  Activation (wlp2s0/wireless): access point 'WLAN-XYZ' has security, but secrets are required. Sep 04 09:43:41 E7440-DELL NetworkManager: <info>  Activation (wlp2s0) Stage 2 of 5 (Device Configure) complete. Sep 04 09:43:41 E7440-DELL NetworkManager: <warn>  Couldn't disconnect supplicant interface: This interface is not connected. Sep 04 09:43:41 E7440-DELL NetworkManager: <info>  Activation (wlp2s0/wireless): connection 'WLAN-XYZ' has security, and secrets exist. No new secrets needed. I have removed F22 and installed F21 on this very same machine. What is wrong with F22 (and F23)? Last edited by blnl; 01-07-2016 at 01:52 PM.